What are the causes of thyrotoxicosis ? Thyrotoxicosis is defined as the state of thyroid hormone excess. 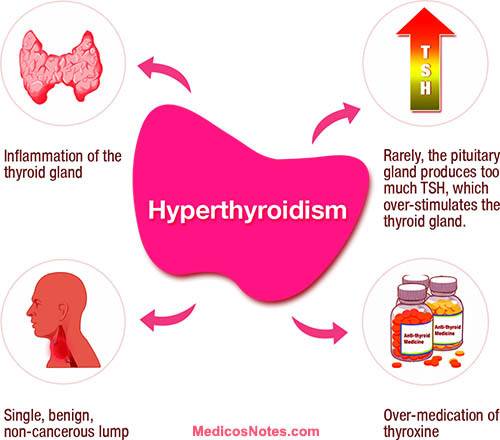 But it is not synonymous with hyperthyroidism, which is the result of excessive thyroid function. Activating mutation of the TSH receptor. Activating mutation of Gs alpha (McCune-Albright syndrome. Struma ovarii ). Other causes of thyroid destruction are amiodarone, radiation, infarction of adenoma. Ingestion of excess thyroid hormone (thyrotoxicosis factitia) or thyroid tissue.